First, some background on California’s upward trajectory on EV adoption. There are many reasons for the Golden State’s leadership in this area; including those that stem from clean air policies, such as the ZEV program, and other programs like EV rebates that the state has put in place to address its acute pollution problem from cars and trucks. Recent years have also seen hundreds of millions of dollars in announced investments from California’s major electric utilities to facilitate the building out of a network of EV charging infrastructure and to conduct education and awareness programs. Over the past several years, a number of states in the central part of the US have also been busy developing their own EV programs. Although the region has not achieved the same level of EV adoption—yet—there is a growing ambition and steady progress. This post will be the first in a series that will cover the numerous actions being taken in this region by utilities, states, and through efforts by multi-sector stakeholder groups, with an initial focus on utility EV programs. While this region generally gets less media coverage, the work underway and progress being made is integral to drive EV adoption and infrastructure in the nation. 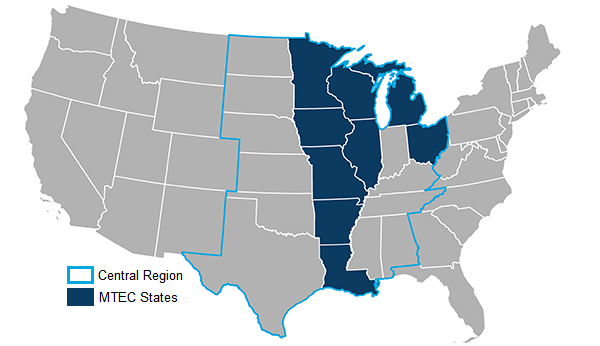 Note: we’ll use the name “Central Region” (see figure 1 below) which is defined by the US Census and includes all the states that aren’t part of the Mountain West, West Coast, or East Coast. The Central Region has a major opportunity to decarbonize transportation through the greater use of EVs. This is because, in general, the region has an electric grid with declining carbon emissions through expanded renewable electricity generation and a reduction in coal-based generation (see this study on the Upper Midwest as an example). A current challenge for the region is that, with a few exceptions, it does not have strong state policies in place that will advance EVs. In addition, the region has vast rural stretches where consumer preferences don’t always match the early EV offerings from automakers and where the political landscape could make such policies more challenging to enact. If EVs can gain traction in the Central Region, it will send a powerful signal to the market that they can gain traction everywhere, delivering savings to a broad swath of American consumers and resulting in reduced emissions and improved air quality. As this blog post illustrates, this has already begun. Importantly, stakeholders in the region have played an active role in getting organized to promote transportation electrification. 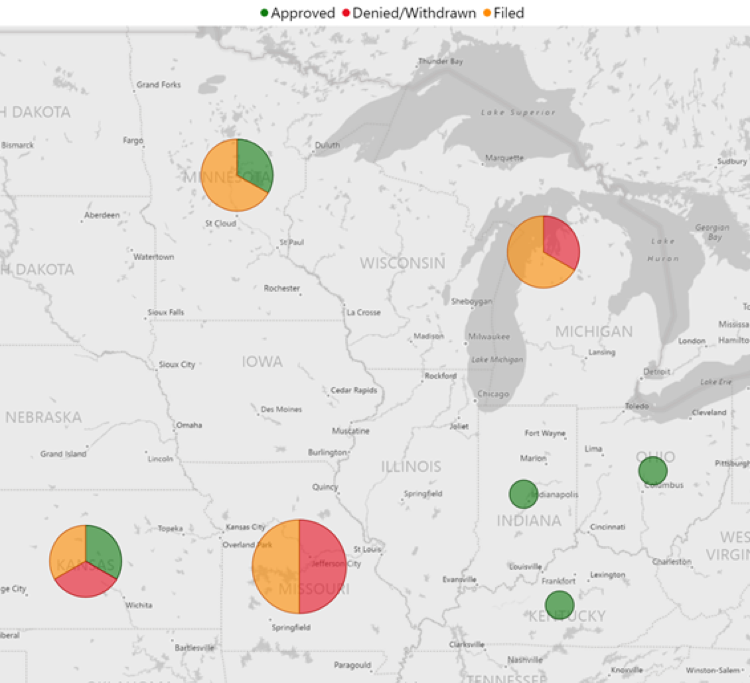 A leading example of this is the Charge Up Midwest Coalition, which formed in 2016 to increase the capacity of advocacy organizations in the region to engage on state policy and regulatory proceedings related to EVs. 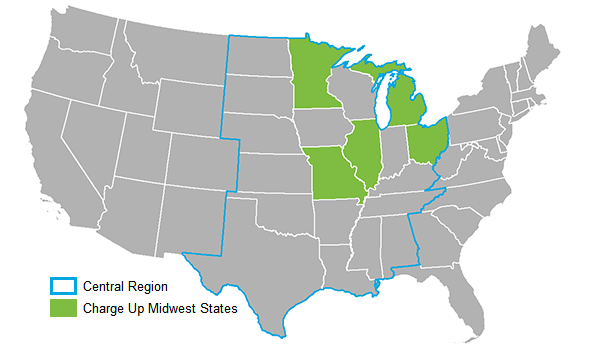 The members of Charge Up Midwest1 have engaged actively with utilities and regulators to shape and encourage utility EV programs, advocated for investments of the Volkswagen settlement funding in EV infrastructure and vehicles, and led broad-based education and outreach efforts with policy makers and the public. Another regional initiative, the Midcontinent Transportation Electrification Collaborative (MTEC) launched in March 2017 as a partnership between Charge Up Midwest and a long-standing electric sector initiative called the Midcontinent Power Sector Collaborative (MPSC), which is convened by the Great Plains Institute. MPSC is committed to decarbonizing the electricity sector and has recently embraced decarbonizing transportation through EVs as well. MTEC includes utilities, automakers, charging companies, state officials, and NGOs. Like Charge Up Midwest, MTEC focuses on EV utility programs. The first MTEC work product, released in April 2018, is a consensus set of guiding principles to inform utility EV programs. As an early measure of MTEC’s success, six different organizations cited the MTEC whitepaper in public comments as part of a Minnesota Public Utilities Commission generic EV docket. Of course, not everything happens regionally; there are many actors at the state and local level that are contributing to the progress being made. At the national level, groups like the Alliance for Transportation Electrification are actively participating in commission proceedings to share good practices and provide a national perspective on utility engagement in transportation electrification. And while the multi-stakeholder efforts provide important support, it is the utilities and regulators themselves that play the pivotal role in these EV filings and decisions. As we consider program implementation and facilitating market expansion, utilities will play a key role in infrastructure with active regulatory oversight and guidance. A robust stakeholder engagement process before EV filings and during the implementation phase is critical since transportation electrification is an emerging area with a variety of new companies, organizations, and other “players.” This collaborative process will be essential for initial pilot programs to reach greater scale. As figures 4 and 5 (below) illustrate, there has been a great deal of activity on the part of regional utilities in proposing EV infrastructure investment programs. Programs have already been approved totaling over $14 million in investment, with another $71 million pending approval. There has been some kind of activity in seven states. Although $25 million in utility investments were denied or withdrawn, this has generally led to a continued effort to create a more broadly supported initiative, rather than a cessation of activity. There is a growing and accelerating interest from regional investor-owned utilities in the central region in making investments in charging infrastructure. Figure 5 shows increased activity in filing EV programs for consideration by state utility regulators. This activity is occurring in many states. Reduce potential impacts to the grid. Utilize rate design to encourage beneficial consumer charging behaviors. Increase education and awareness of electricity customers and the general public about EVs. Establish a foundational charging infrastructure that addresses an identified market failure while also preserving market competition among suppliers of EV charging services and equipment. Ohio provides another great example of progress in the Midwest, with the Public Utilities Commission of Ohio (PUCO) recently approving the first utility EV program in the region. American Electric Power (AEP) Ohio got approval for a $10 million program that will deploy up to 300 Level 2 and 75 DCFC EV charging stations in their Columbus-area service territory. Up to 20 percent of the stations will be made available to multi-unit dwellings and 10 percent will be located in low-income areas. In addition, the PUCO convened a PowerForward grid modernization proceeding this year that included further exploration of the role that utilities could play in supporting transportation electrification. The resulting commission white-paper called on utilities to file grid modernization plans that include system-planning to maximize EV benefits and to address the need for EV charging in specific market segments. Another recent example is the filing by Xcel Energy in Minnesota. Their $25 million proposal, filed on October 15, will include supporting fleet adoption of EVs for state vehicles, the city of Minneapolis, and a transit agency by helping to set up charging infrastructure. They will also invest in “community mobility hubs” in St Paul and Minneapolis for use by the Hourcar car-sharing service, Uber and Lyft, and the general public. Overall the program will invest in 350 EV charging stations. Additional programs are planned for the near-future. In Missouri, Kansas City Power & Light was a first mover in the region, deploying 1,000 charging stations beginning in 2014. That effort proved that if you build it they will come; Kansas City led the country in EV adoption for two years. Kansas City Power & Light’s request to recover for this investment met resistance at the Missouri Public Service Commission, but sparked an important commission-led stakeholder process to educate regulators and Commission Staff. Now, the commission is reconsidering an earlier ruling that limited the role for utilities at the direction of a Missouri appeals court. In addition to KCP&L’s program, Ameren has an $18M program before the Commission that would develop charging infrastructure for both on- and off-road vehicles, like forklifts, airport ground equipment, and other applications. There have also been filings in Indiana, with more in the works in other states. Furthermore, while this article focuses on actions by investor-owned utilities, cooperatives, and municipal utilities are also increasingly active in bringing the benefits of EVs to their members and customers. All of this growing activity points to a region poised to expand development of utility EV programs. While the Central Region of the US has lagged in EV sales and policies that would help to boost this growing market, this appears be changing, especially in the utility sector. Many stakeholders (and of course the utilities themselves) have been essential players in advancing the utility EV programs in the region and making progress on expanding the EV market. 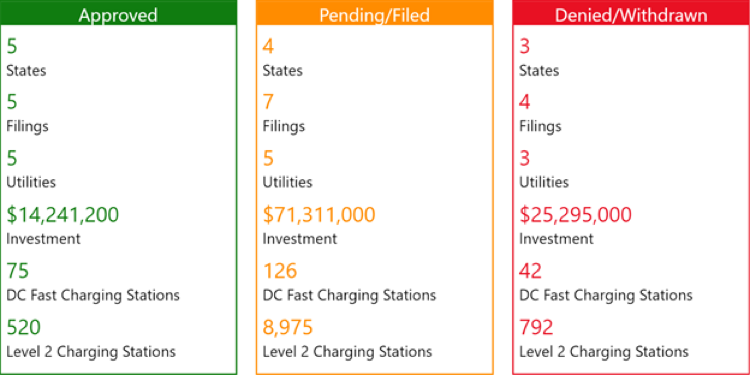 We’re proud of the work that members of the Charge Up Midwest coalition have contributed to these efforts, including playing an active role in almost all of these utility EV programs. In addition, MTEC is now helping with support and guidance for utility and other EV policy efforts in the region, including through the just-launched decarbonization road map. We hope to show that a collaborative effort including all the parts of the EV industry can have a real and meaningful impact, and drive EV adoption and infrastructure development in this key region of the country. In future installments of this blog series, we will cover regional progress on state investments in charging infrastructure through the Volkswagen settlement and other policy initiatives within the region. Charles Griffith is the director of the Climate and Energy Program at the Ecology Center and is the facilitator of the Charge Up Midwest coalition. Nick Nigro is the founder of Atlas Public Policy and a senior advisor at the Alliance for Transportation Electrification. Brendan Jordan is the vice president of the Transportation and Fuels Program at the Great Plains Institute and the facilitator of the Midcontinent Transportation Electrification Collaborative.